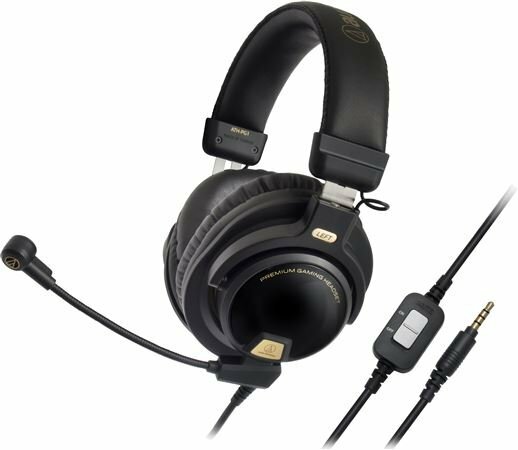 Order your Audio-Technica ATH-PG1 Premium Gaming Headset from AMS and enjoy 0% Interest Payment Plans, Free Shipping, Free Extended Warranty & 45 Day Money Back Guarantee. Designed with the serious gamer in mind, the ATH-PG1 delivers wonderfully immersive audio and long-lasting comfort that puts you in the game and lets you stay there as long as you want. Large 44 mm drivers provide powerful, lively sound specially tuned to accentuate all the sonic detail of the gaming environment. The closed-back headset is constructed of lightweight materials and features soft leather headband and ear pads, allowing you to play on without fatigue. The ATH-PG1 also comes equipped with a flexible, 6" boom microphone for crystal-clear in-game voice communication with other gamers. This mic, with 1.2 m cable and in-line volume and mute control, can be detached and replaced with a 1.2 m smartphone cable, which includes its own mic and portable-device controller. An additional 2.0 m extension cable terminating in two 3.5 mm mini plugs for mic and audio works with either of the 1.2 m cables to provide increased flexibility when gaming on a computer.